Being an educator has been one of the greatest joys of my life. Sharing knowledge, experience and hopefully– by now– my wisdom has given me the opportunity to watch minds, hearts, spirits open to their own passions, wisdom, creative energies. Be it through the sharing of stories in sacred circle, moving/awakening/healing our bodies, concocting fragrance, creating beauty, sharing our gifts and talents with one another or humbly traveling to distant lands… educating and experiencing our selves and others– is sacred work. And no reason it can’t also be quite joyful! All the Classes, Workshops, Pilgrimages, Retreats, and Sacred Travel that we offer here are our way to help encourage you to step up, listen, follow the inner call and allow yourself to find a piece of that soul essence that is calling to you. Find your Bliss! It is what you have come to offer the world in your unique and powerful way. We invite you to let us inspire, uplift and support you on your way to finding the passions of your heart and soul. Scroll down or click to proceed directly to the Curriculum, Ongoing Classes or Current Schedule sections of this page. Since being gifted (downloaded) with this body of work, the Mary Magdalene Goddess Mystery School Teachings (GMS) have become a major part of a covenant that I have entered into: to share and bring forth, dedicatedly, all… in Her name. This work has changed my life– by virtue of learning to trust the inner voice within me… to follow, take heed and to know that there is something greater within us, that truly guides us on our path if we will but listen. The voice of Mary Magdalene– the archetype of Her presence– has been my muse, which has allowed (and urged) these teachings and the sacred fragrances to come forth and to be shared. There is great holiness in each of us– and the wisdom of this wishes to be remembered. The Goddess Mystery School Teachings of Mary Magdalene are a way to open up to the light within you, and the aromatic alchemy that has been created to honor her teachings will assist you along the way. This work is an in-depth study of the seven spiritual virtues to the path of Love. The mystical and personal realization of the alchemy of each of the teachings is the goal of Mary Magdalene’s Goddess Mystery School as I have received these teachings. The alchemical transformation of each person is revealed through the Magdalene herself as the teachings are incorporated into a daily spiritual practice. The truth contained in each of the teachings begins to awaken the heart, soul and spirit of those who desire to walk the path of Love with her. 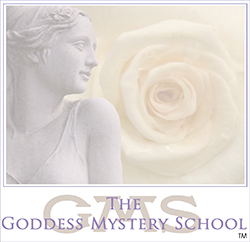 The Goddess Mystery School teachings are supported by a Collection of seven sacred scents and aromatic elixirs created for each teaching by Joan Clark, plus the unifying/balancing Yeshua scent— the alpha and omega– which first inspired this work and now ties it all together. Look to this page for updates on events, and contact me for more information and to sponsor a class in your area. We offer our gifts, talents and abilities to one another. We dance, pray, create and share our stories. 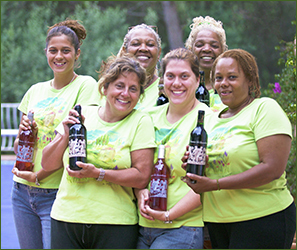 We empower, uplift, inspire and weave a circle of Oneness– as we honor the Goddess within and without. It is a special time for each of us. We move between the veil of time-and-space and enter into a sacred place where unity, community and the teachings of the Goddess are remembered, honored and shared. We work with plant spirit medicines– for they are our great connection to the earth, moon, sun, stars, the elements, our ancestors our body temples and mostly… to one another. We honor our path as the divine feminine presence, and we understand the power of the moon and our connection to her. I feel that travel is not a luxury: it is a necessity for the soul to find, remember and experience parts of itself that may have gotten lost along the way. Travel challenges us to defy our comfort zone– allowing us to nurture new skills, talents and abilities. Once stretched in such a way, our confidence and outlook in the world never shrink back to the same size. Our travel– and especially anything billed as a pilgrimage– is generally structured along such sacred lines. Be forewarned that shifts occur, and such change Is not always necessarily comfortable in the moment. This is not to say that they aren’t infused with much joy as well. As such–unless billed otherwsie– those looking for a primarily recreational tour are encouraged to enjoy these rich locales by other means. Please scroll down to the Current Schedule, to learn of upcoming trips, designed especially to tantalize and awaken the senses, expand our breadth of experiences, increase our appreciation of beauty, and deepen our sense of the sacred. ** Should details be lacking for trips scheduled more distantly in the future, please visit the Past Sacred Travel and Pilgrimages page, with details, itineraries, and flyers of recent journeys– to give you a better of sense of what you can anticipate on your personal adventure of choice. For 2 days you will actively participate in the understanding of the different synergies and essential oil combinations that are in each blend as well as the application and use of each synergy. 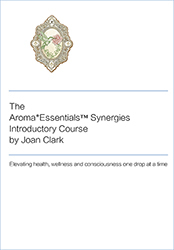 The course fee is $950.00, and includes samples of each of the Aroma*Essential Synergies, as well as all educational documents which support these synergies. Participants will also be able to purchase the Aroma*Essential Synergies for resale. To host or book a class, please contact us. Aroma*Fitness is a lifestyle concept that I created as a way to introduce the use of essential oils and aromatic alchemy into a fitness regime over 30 years ago. When I first started not many people were using essential oils, and if they were it was not in conjunction with fitness of any kind. As we started educating people on the power of essential oils to enhance fitness workouts we saw a dramatic shift and a movement began taking place. From the yoga practitioner to the body builder…the meditation, tai chi and pilates instructors… all began incorporating them into their work-out formats. **You might consider learning more about incorporating my blends into your discipline– for added benefit, and to further distance yourself from the pack. Living an aromatic lifestyle has been my personal mission for over 30 years and sharing this passion has inspired thousands and thousands of others to live into this philosophy as well… with great benefit. Classes/Workshops are often ongoing and being added. Please don’t hesitate to contact me to schedule a series or intensive in your area. This workshop introduces and complements the Aroma*Woman collection of Goddess synergies that empower and embrace the beauty and the rites of passage of the female body. Along with working with these synergies the workshop will include group work, a circle ceremony where we will share our rites of passage through song, dance, shared stories, and art… and more. Workshop tuition includes includes samples of the Aroma*Woman Synergies. The Natural Perfumery Class is for anyone who is interested in natural fragrances who would like to learn how to create his or her own natural perfumes. This class will focus on learning the language of natural perfumery, the raw materials of the perfumer, how to make aromatic accords (top, middle, base notes), record keeping to make sure you can recreate your blend with ease, hands-on blending with a variety of different natural aromatic essential oil essences… and much more. If you love fragrance, creating and learning about the natural world– you will enjoy immersing yourself into the Art and Pleasure of Natural Perfumery. We also offer a 4-hour introductory course that you can sample before enrolling in a 2 day intensive. 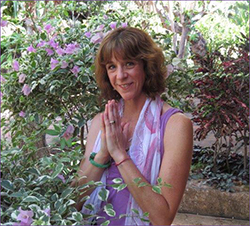 Present Moment Kundalini Yoga and Acupuncture– Sundays, 2 pm. Our Present Moment Yoga classes at LunaBella are a combination of Kundalini Yoga, Chanting, Meditation, Breathwork, Gong Healings and Energy work accompanied by the use of crystals, and essential oils. Acupuncture is sometimes available to be administered after, to take our practice and intentions deeper and to release what no longer aligns with our desire for wholeness of body mind, soul and spirit. Space is limited. RSVP is required. 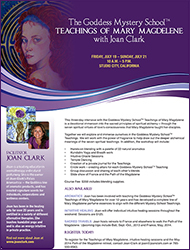 Mary Magdalene Goddess Mystery School 12-Month Training– Last Sunday of each month, 2-5 pm. 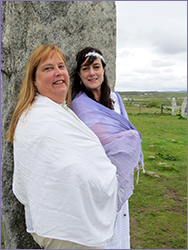 The Goddess Mystery School (GMS) Training is an in-depth study into the consciousness and teachings of Mary Magdalene– Her rites of passage into Her own sacred alchemy as healer, visionary, oracle, alchemist, woman, wife, mother… apostle to the apostles. This training is a 12-month long initiation which incorporates creating plant spirit alchemy, aromatic blending, meditation, yoga, hands-on healing, intuitive awareness, prayerwork, chanting, sacred dance, creating altars/ceremonial space and more. 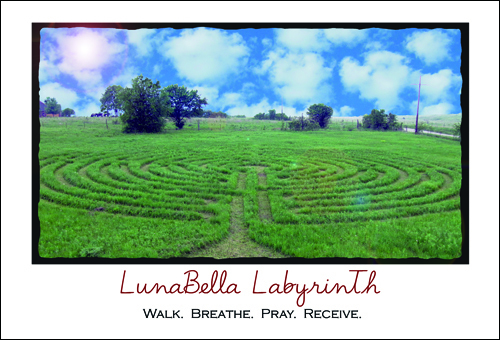 On the last Sunday of each month we gather and unite– at LunaBella in Lawrence, KS– in holy community with other women who have been called to be a part of Her teachings, alchemy, archetype and consciousness. Sometime during the training (often around the spring solstice) we journey on a trip to France, guided by Joan, to walk the path of Mary Magdalene: visiting the sacred sites where she has been honored and remembered for centuries (this pilgrimage is optional, and not included in training tuition). The training is a commitment, and a closed circle, year by year. Upon reforming each year as the calendar works back around to Her Feast Day of July 22nd, a new circle forms, with new and experienced participants committing for a subsequent 12 months. “We do not ascend by doing but by being.” “I am awaiting you.” — MMTuition: $540.00 for the year (non-refundable, an auto-deduct $45/month payment plan may be available upon arrangement). 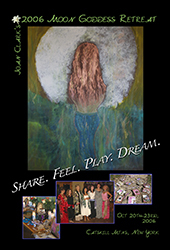 Powerful Passionate Women for Peace– New Moon and Full Moon Gatherings– Check your calendar for new and full moon dates. Each new moon and full moon a candle is lit by women across the globe to unite in the prayer for peace and oneness. We connect wherever we are and align with the intention that we are Powerful, Passionate Women holding the vision of peace within and without. Monthly Prayer Circle Conference Call–Last Sunday of the Month, approx. 7pm Central. The fourth Sunday of each month we collectively gather from all across the country and abroad to unite in prayer with the Divine Mother. This is a monthly conference call where all are welcome. We have a Goddess Prayer Group Facebook page where you can request to join, become part of the group, receive the call-in info and keep in touch. Within the circle we open ourselves to receive a monthly message for the group, then to prayer– for one another and/or for the world and all of humanity. Here you can request for specific prayers for yourself and/or others. Lunabella Labyrinth is open to the public, sunrise to sunset, year-round, for anyone who desires a peaceful prayer walk in nature. Walk. Breathe. Pray. Receive. No appointment necessary. Everyone is welcome. Download flyer for more info. This year our retreat will include a new training that will assist those working with plant spirit alchemy and the akashic records. After our trip to Egypt last year– where we sat in front of the Sphinx, home to all akashic records– I felt a deep calling to reawaken that training in me and to use it more fully with my work with the plants. It has been an incredible tool, and at this year’s Moon Goddess Retreat we will offer a certification in the Akashic Records with a wonderful teacher and then we will incorporate that into our work with the plants. I am very excited about adding this knowledge to our work with the plant spirits. For those already certified in offering Akashic record readings– you will be able to reinforce your training with us. For more information please Download full-color flyer. And to register– please Click Here. 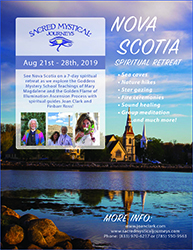 I am very excited to invite you to join us on our Nova Scotia Spiritual Retreat this year. Besides being able to share my passion about with the Mary Magdalene Goddess Mystery School Teachings, we will be able to partake in the Golden Flame of Illumination Ascension process with my dear friend, spiritual guide Finbarr Ross. We will immerse ourselves in the beauty, wonder, and magnificence of Nova Scotia while being awakened with many wonderful teachings and experiences. This is going to be a gathering like no other, so treat yourself and join us for a life-changing week with other like-minded and heart-centered people. Expect Illumination, exploration, beauty, and awakenings! 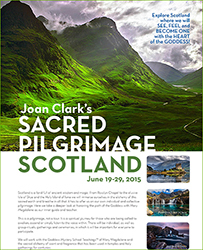 This trip is being conducted in partnership with my friend Finbarr Ross of Sacred Mystical Journeys. For more information and itinerary please Download full-color flyer, And/or for additional info including itinerary and TO REGISTER, please visit the trip for this journey at SacredMysticalJourneys.com. This has been a long awaited pilgrimage of mine, and will be magical and powerful in so many ways.We are excited to invite you to travel with us to Ireland– the land of poets, mystics, wandering hills, deep forests, and some of the most beautiful emerald landscapes in the world; a place of alchemy, wisdom, ancient lore and prophecy. Ireland is a land of exquisite beauty and holy sites where rituals and ceremonies for the sacred have been honored throughout time. Here one connects more deeply to the land, one’s roots, one’s self. And from here one prepares to draw in their Anam Cara– literally soul friend– sacred intimate, whether in the form of one’s highest Self, a teacher, spiritual guide, companion. An inner and/or outer manifestation of a sacred friend who frees the wildest possibilities within us. Thus we journey together in search of a homecoming– a tilling and making ready of the soil of our essence– such that we prepare to receive and have received, at more profound levels, authentic essence– the next level of being. Where we fall headlong in love with our own oneness and divinity. As we traverse the beautiful countryside listening to the ancient lore, presenting ourselves at sacred sites, our mission will be to unite with the inner soulmate/soul-friend/muse who has brought us to this mystical homeland. Each place we visit shall open us up to the power and presence of our own inner soulmate– which is our true divine partner throughout all eternity, the essence within us that never ends but moves with us lifetime after lifetime. Over hill and dale– from Dublin, the Book of Kells, Newgrange, the Boyne Valley, Glendalough, Kildare, the Ring of Kerry, Blarney, Killarney, Kenmare, and beyond– we squeeze in as much of the sacred, ancient, magical and delightfully joyful as any band of pilgrims possibly could! For more information and itinerary please Download full-color flyer. And to register– please Click Here. Traveling again to one of my favorite places to guide another pilgrimage through Magdalene sites across the south of France. To give you an idea of an approximate itinerary please visit my Past Sacred Travel and Pilgrimages Page to view a full-color flyer of a past trip.